Will it chip? Part 2. My son doesn’t eat veggies. This is really embarassing to admit. We actually eat a variety of healthy food at our house. Local and organic when possible or feasible. Little M is the epitome of a fabulous eater. She will try everything and continue eating about 99% of it. She cleans her plate and never complains. Little C is definitely his own person. But I digress. We have had enormous success feeding him veggie “chips” or as he says it “tsips”. And this was no exception. He loves these like dogs like rolling in smelly things. They’re that good. We’ve tried these a few ways: low and slow, high and quick. I think it depends on how much moisture you have in the sprout leaves and how much crunchy versus chewy you go for. 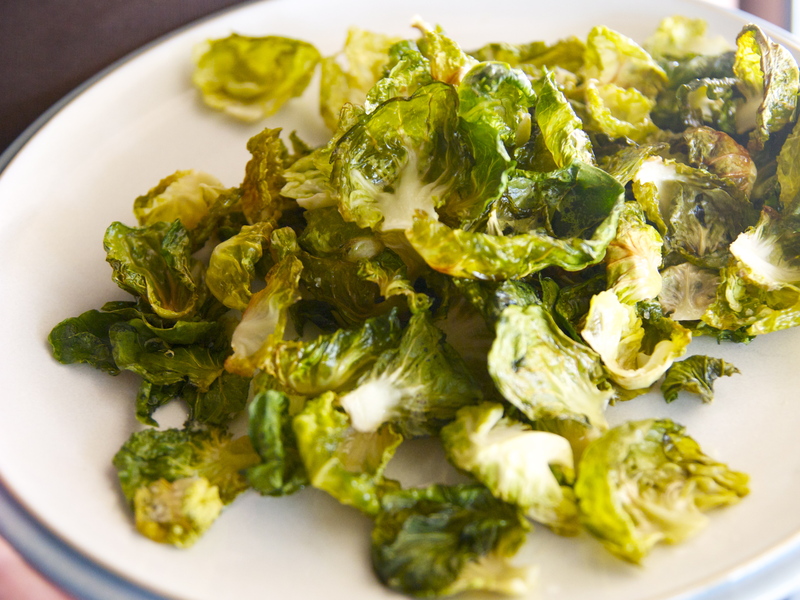 Remove as many of the outer leaves from your brussels sprouts as possible. This might require cutting the stem periodically. Wash and dry thoroughly. Preheat oven to 300F. Toss with good quality olive oil and lay out in a single layer on some parchment paper on a baking sheet. Dust with salt (or pepper or herbs or parmesan cheese: you get the picture) to taste. Bake for 20 minutes, checking to see if they’re getting too brown too quickly. If so, turn the heat down and possibly increase the time. Testing one or two chips is always an option to know where you are in the scheme of things. Verdict: Not quite as crunchy or delicate as the kale chips, but still quite delectable. Devoured by all. It chips!